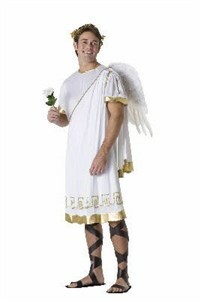 Wear this Adult Cupid Costume and you will be the icon of love! There's no better way to embody romance than by sporting the tunic, belt, and headpiece of this Roman God costume. While wearing your Cupid costume, be careful not to fall in love with the beautiful woman dressed as Psyche at your Halloween party! One size fits most. Availability: This Cupid Costume takes approximately 1-2 business days to leave the warehouse plus transit time.